Attorney General Jeff Sessions speaks during a news conference regarding the country's opioid epidemic in Cleveland, Aug. 22, 2018. Sessions has pushed President Donald Trump's agenda at the Justice Department and spent 20 years before that as a champion of conservative causes in the Senate. WASHINGTON — Attorney General Jeff Sessions has vigorously pushed President Donald Trump’s agenda at the Justice Department, and before that, spent 20 years championing conservative causes in the Senate. Yet as Sessions enters what may be the final stretch of his tenure, those efforts are at risk of being eclipsed by his boss’ relentless verbal jabs that have made the attorney general seem like a perpetual presidential punching bag. It’s a role Sessions never sought but perhaps could have anticipated. The steady diatribes, most recently a tweet excoriating Sessions for the federal indictments of two Republican congressmen, reflect Trump’s single-minded outrage over the special counsel’s Russia investigation and are all the more striking because Sessions is the Cabinet member most clearly aligned with Trump’s values. The treatment has largely overshadowed the attorney general’s work on violent crime, illegal immigration and opioid addiction, clouding a legacy that in other times would be more broadly cheered in conservative circles. Sessions has mostly absorbed the blows quietly while marching through a tough-on-crime agenda, bringing to the job the same hard-line principles that once placed him far to the right of many other Republican senators. 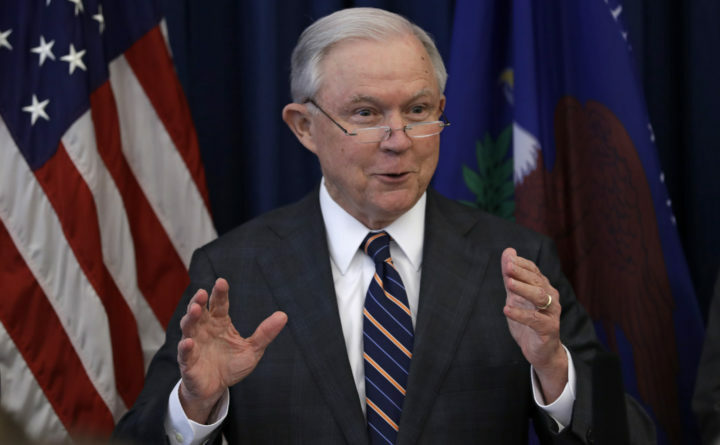 He has encouraged more aggressive marijuana enforcement, directed prosecutors to bring the most serious charges they can prove, announced a zero-tolerance policy for immigrants crossing the border illegally and targeted the MS-13 gang. He also has alarmed his critics, who fear he has degraded civil rights protections by not defending affirmative action, police reform or transgender legal rights. But neither Sessions’ work nor his loyalty seems to resonate with Trump. The president has belittled his attorney general since Sessions stepped aside from an investigation into ties between Trump’s 2016 campaign and Russia. Trump interpreted the move, which legal experts said was inevitable given Sessions’ campaign support, as an act of disloyalty that led to special counsel Robert Mueller’s appointment. Trump has said if he had known Sessions would take that step, he would not have picked the Alabama Republican to be attorney general. The president now asserts that Sessions never has had control of the department, and accuses Sessions of failing to aggressively pursue Trump’s political rivals and to investigate potential bias in the Russia investigation. Trump told Bloomberg News last week that Sessions’ job was safe through the November election. The president gave no reassurances about after that. Meanwhile, the solid Republican support in the Senate that has buffered Sessions is showing signs of cracking. Sessions didn’t respond to that criticism, though in the past he’s issued statements saying the department won’t bend to political considerations and promising to serve with integrity and honor. His only mentions of Trump are laudatory, and in public appearances, Sessions is far more likely to focus on the work that has impassioned him for decades than on the controversies around him. The criticism has created an unusual dynamic where Trump-aligned Republicans who ordinarily would praise Sessions are joining in the condemnation, while progressives opposed to his agenda fear that his firing for political reasons could destabilize democracy. Vanita Gupta, the Justice Department civil rights chief in the Obama administration, said she believed Sessions was terrible for civil rights but she did not want him dismissed as a means of crippling Mueller’s investigation. His conservative Senate positions, including opposing bipartisan legislation that would have created a path to citizenship for millions of immigrants in the country illegally, made him a natural fit for Trump. Sessions was the first senator to endorse Trump, joining the candidate for campaigning and foreign policy meetings. The loyalty paid off with the attorney general post, but it also wound up entangling him in the Russia investigation. Even as Sessions has pushed the Trump agenda, he’s confronted headlines about his campaign interactions with the Russian ambassador and about his attendance at a campaign meeting where the prospect of a Trump-Vladimir Putin meeting was broached. Associated Press writers Michael Balsamo and Jay Reeves contributed to this report.